Just what exactly is a deckhand? A deckhand is a key crew member for any size vessel. A deckhand is the entry level for almost all professional crew jobs on superyachts. Deckhands help keep water vessels clean and in sound mechanical condition. They must have basic knowledge of vessel operations and maintenance, a good understanding of maritime safety practices, and the physical stamina to cope with labor-intensive tasks. The deckhand position will encompass many responsibilities, but most importantly, he/she will maintain the exterior of the yacht and keep it in pristine condition at all times. Deckhands, depending on the vessels on which they work, may be referred to as tugboat deckhands, dredge deckhands, ferryboat deckhands or scow deckhands. This job may suit people with a passion for the sea. 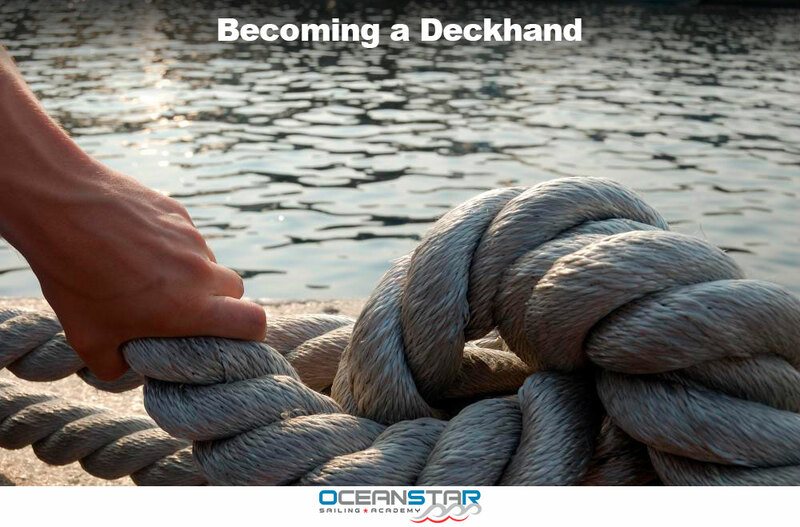 Receiving professional training is the best way to get started as a deckhand. Some Sailing Academies or RYA accredited schools, such as Ocean Star Sailing Academy in Cape Town, offer certificate programs that train prospective deckhands. Your chances of getting employed as a Deckhand will surely increase should you have completed a deckhand course at a reputable academy. To be an accomplished deckhand, you need strong technical skills and an aptitude for practical work. You should be able to effectively operate winches, capstans and other deck equipment, as well as perform physical tasks such as lowering lifeboats during emergencies. You must have standard colour vision to easily recognise colour-coded signals from the vessels’ electrical components and problem-solving skills to perform basic repairs, such as replacing worn cables. You must work alongside stewards, mates and other crew members. Doing your Deckhand course at an academy such as Ocean Star Sailing Academy will increase your chances of employment at sea, with the school currently having over 85% of past students currently employed at sea.